Switching gears here since a girl likes to mix things up every once in a while. 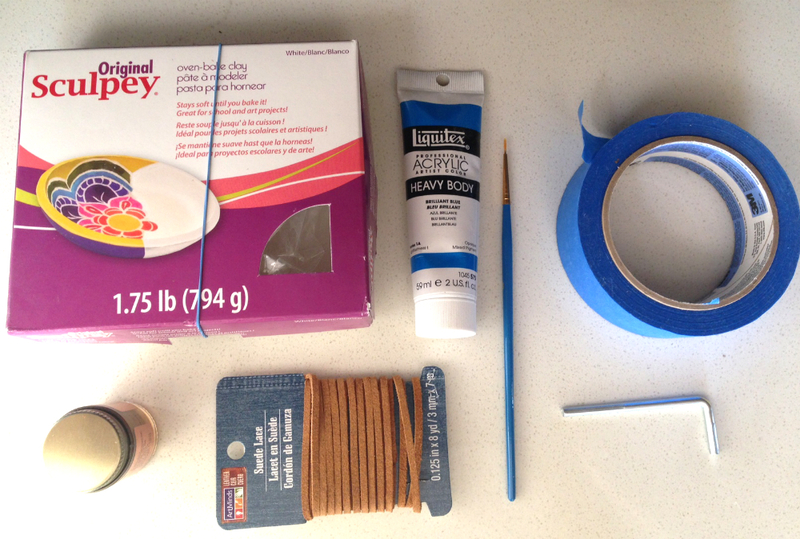 Actually, jewelry making was my very first crafting love, so I’m serving it up old skool with today’s DIY. But I can’t take all the credit. I was inspired by the craftiness of a friend and fellow design addict whose to-die-for Eichler I featured in an earlier post. Karolina made this killer necklace that she learned from blogger Laura Parke of A Girl Who Makes and I’m a smitten kitten. Since I believe in a zero waste standard of crafting, I decided to make the same necklace with some twists using leftovers from my geometric planter project. Ah, the days of being a carefree child making clay beads and jewelry just because I could. There’s absolutely nothing wrong with reverting back to childhood every once in a while, so let’s get baking! Roll and knead the clay into a 3/4 inch diameter ball. Using your small allen wrench, screw a hole through the middle. The key here is to screw it through (at the risk of sounding crass). 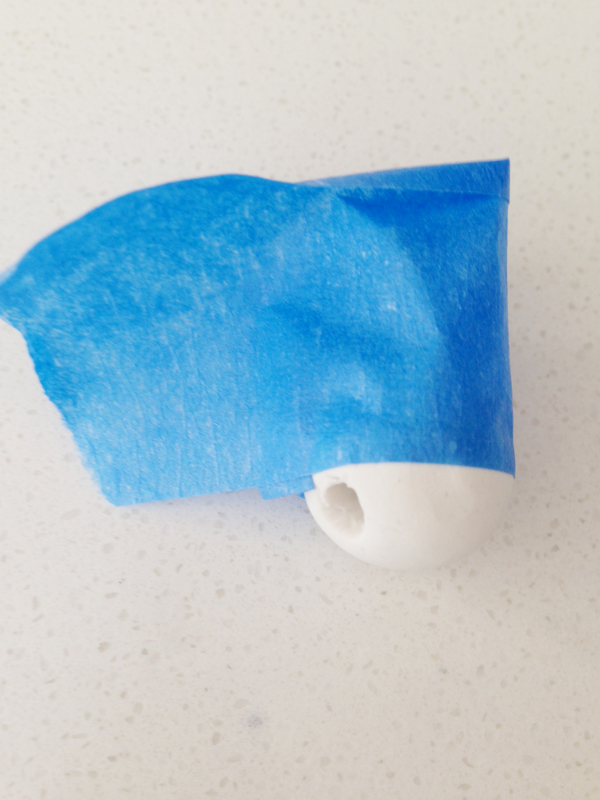 This will prevent the clay from bulging too much on the other end. Bulging will occur, but what you need to do is put the wrench through the hole on the other side as well. Remove the access clay on the tip of the wrench. Since your bead will inevitably lose its round shape, roll and knead it again. Use your wrench to screw the hole again. I found that repeating this process gets the best results. Bake the beads in the oven per the package instructions. 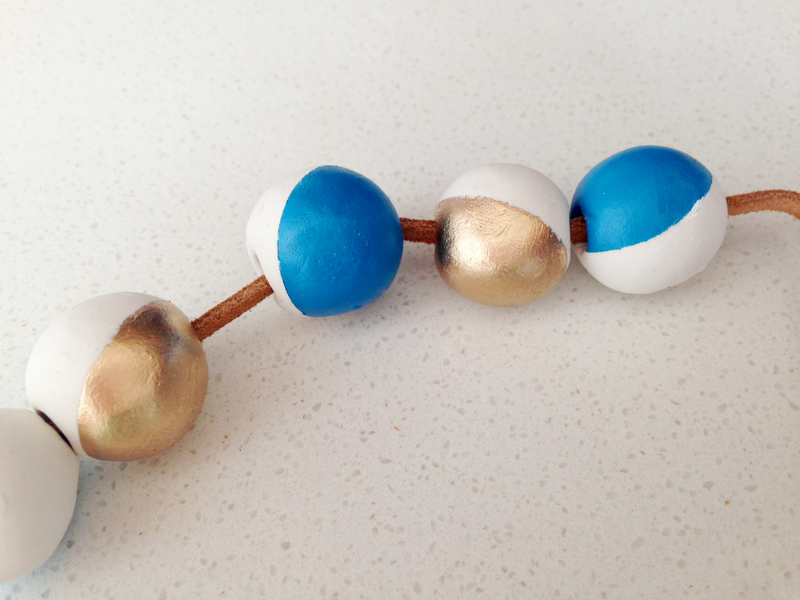 I baked mine for 10 minutes at 275 degrees F.
Once the beads cool off, it’s time to paint. Wrap a strip of painter’s tape around the bead. I did mine diagonally as opposed to Laura’s blog where she does it straight down the middle. We’ll see how it turns out! Paint the uncovered section (duh, obviously). Stand them up on the tape. Make sure you have enough tape to avoid those “oh sh*t” moments. I had one of those when the tape collapsed and my bead went spiraling down the drain. Good thing I caught it in time! 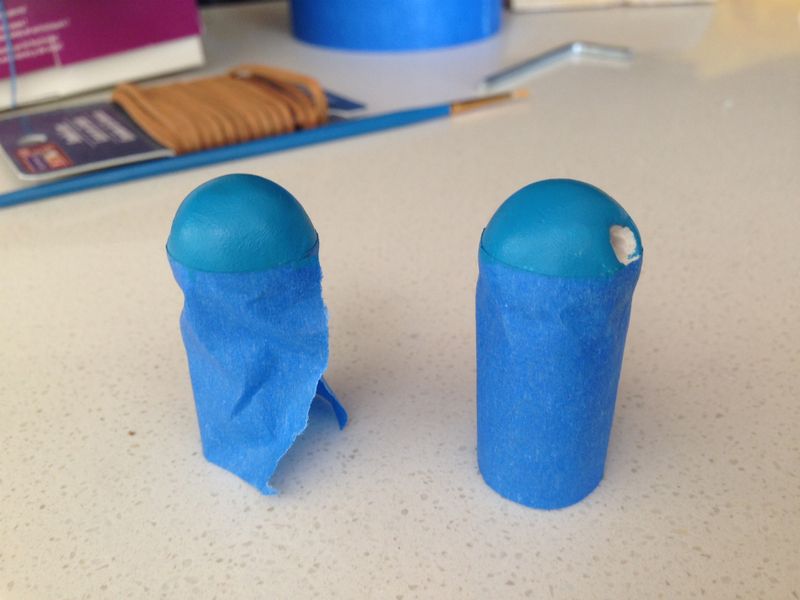 Allow at least an hour for the paint to dry, then carefully peel off the tape. 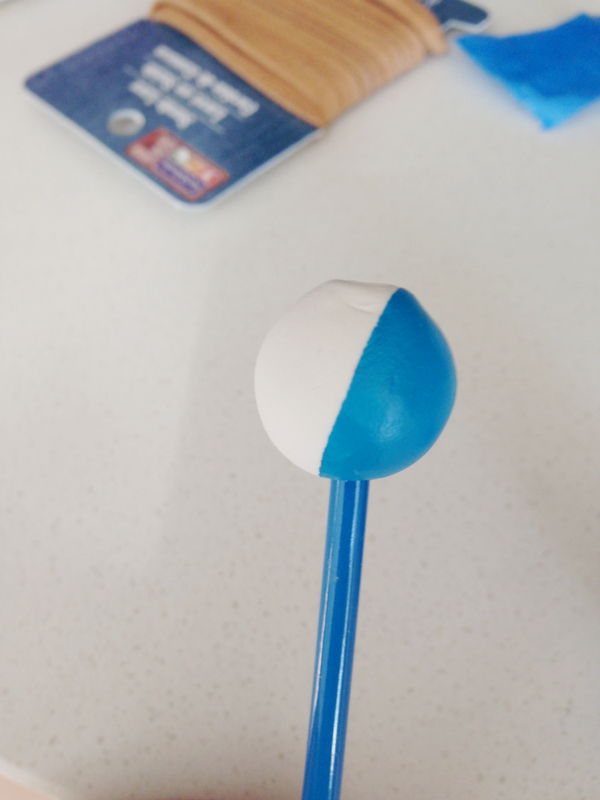 I used the end of my paint brush to hold the bead while I removed the tape. Next, cut the leather string to your desired length and string the beads through. 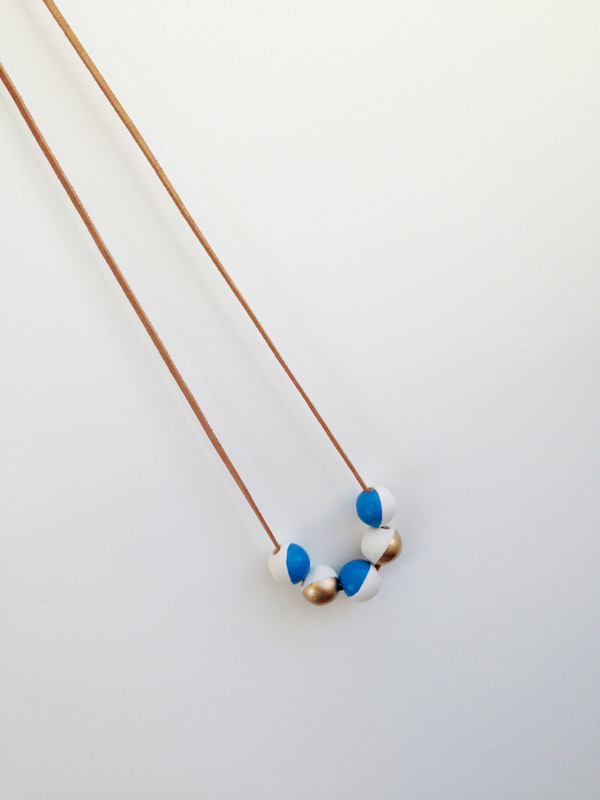 Tie a knot and say hello your new necklace! 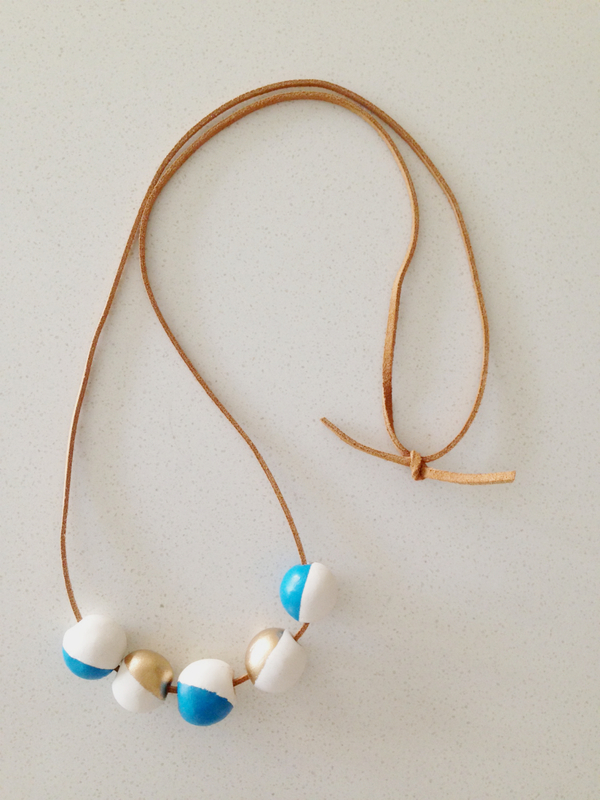 Giving someone a handmade gift or bragging rights that you made your own necklace: priceless (you knew this was coming). Estimated time to make: about an hour and 15 minutes including paint drying time. Note: the diagonal painting looks cool, but the beads will move around. Now I understand Laura’s straight down the middle painting. Your beads will look the same no matter how much they spin. My method will give different looks to the necklace, which can be either interesting or annoying depending on your preference. Love this! So creative and beautiful!